If you are looking for a spacious, stylish and lightful house in the middle of nature, this is definitely something for you. Believe it or not, but there is still a place in the world where you can be alone in the nature, swim naked in the lakes and your neighbours are far enough not to see what you are doing, eating, etc. 20 000 ha nature around you: big trees, rich forests (full of blueberries, cowberries and mushrooms, specially chantarelles), lakes, kayak river, a bog, hiking trails, Karula National Park, lovely Latvia and Riga Airport near you. The house is lightful and spacious. 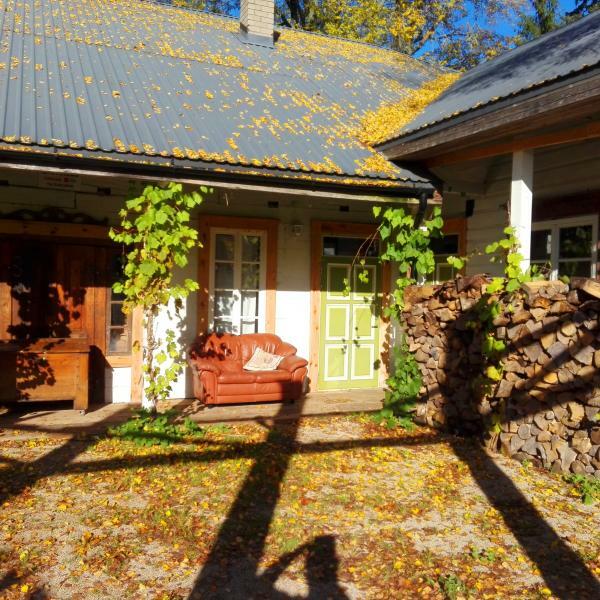 The main floor is 305 m² plus there is a grape terrace 100 m² and an attic 250 m². It is a handmade lodge house with limestone plinth and metal roof. In the centre of the house there is an old wooden venue with wooden stage, where concerts, dinners, weddings, movie nights for friends, etc. could be organized. 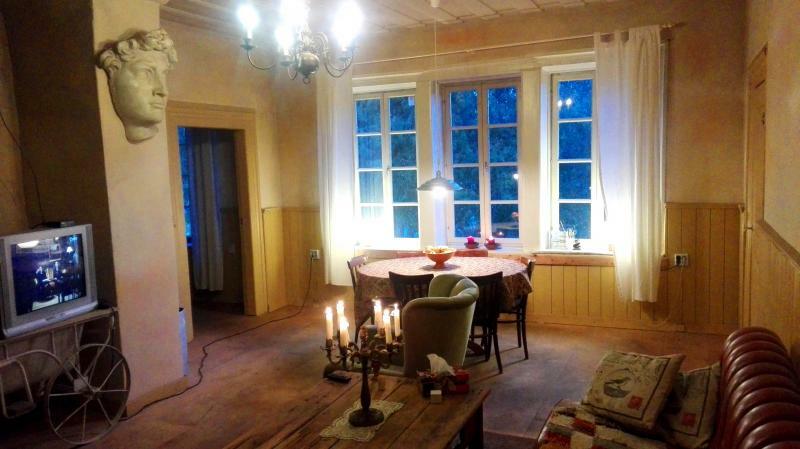 There are 8 rooms and a kitchen, 3 toilets, 2 shower rooms, sauna, and 3 halls. Old furniture is included to the price. The high quality work of carpenters (from 1855) is a value on its own and worth admiring. New doors have been made as the originals were. There are two fireplaces and a stove that give enough heat to live there from spring to autumn. 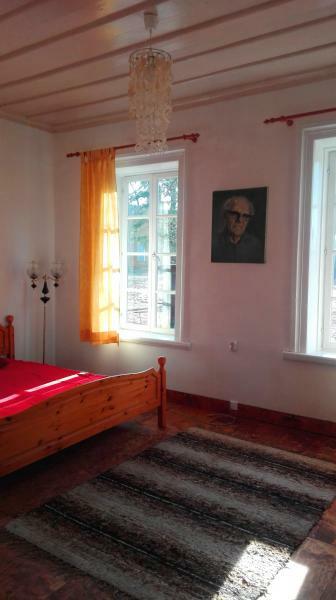 There are wooden framed windows and all original ceilings have been preserved. The ground area is 8000 m², so you can enjoy long walks in your garden. The soil is very rich and salads, vegetables, berries grow easily. The new owner will get some black currant bushes and sweet strawberries that were planted last year, also some beautiful flowers. If you like gardening, it is a perfect place to grow your own ecological food. 1,5 km from the house there is a young family that sells ecological goat cheese and milk and ecological eggs. There is a also a project that permits building the second floor to the attic (at the moment it has been used as a working place). Thinking of safety, there are three water taking places with fast connections put to two wings of the house and to the attic in case of fire. 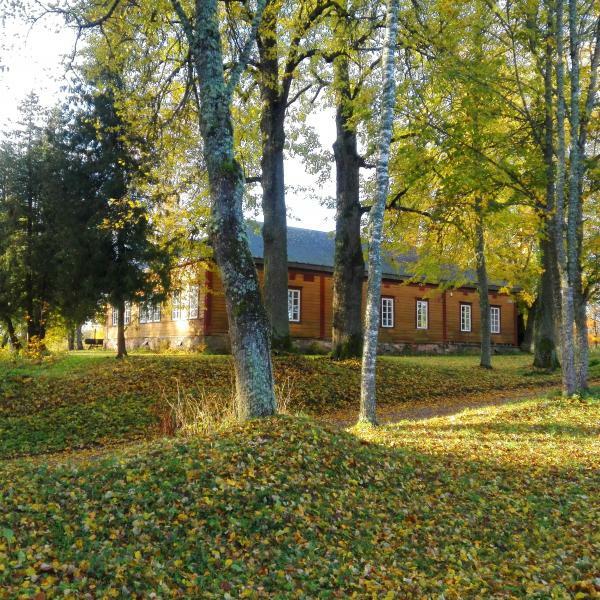 In 1855 in the honour of Zar Alexander II of Russian Empire, in Liivimaa in Laanemetsa a new orthodox church with school and the house of the priest was built. It was dedicated to Apostle Paul and Apostle Peter. The priest moved into the house on 1st April 1855, the church was blessed on 10th July 1855. The money for building the church and orthodox schoolhouse came from Russian Empire, in total 16 600 ruble. In comparison, 3 years later there was Mahtra war in Livonia and the damages were calculated 12 500 ruble and a very good horse would cost 200 ruble. Back then there were no cars, no trains, the whole material was brought there with horses and bulls. As there was no electricity, the trees were cut with axes and saws to wood with necessary sizes and shapes to build the house, so it`s a handmade house. There were 5 same kind of orthodox churches built at that time, the nearest best preserved one is Mõniste-Ristiku church. Unfortunately there are no more of same kind school houses, this is the last one.